Mom Knows Best : The Toughest Monster Truck Tour Is Coming! My boys are so excited that The Toughest Monster Truck Tour will be coming to our town! They asked if we could go see the trucks in action. This mom said "yes!" and the boys are jumping for joy! In addition, you might see high flying Freestyle Motocross riders, a giant fire-breathing mechanical dinosaur, ATV/quad racing, tough trucks or a 2,000 hp jet powered ATV! 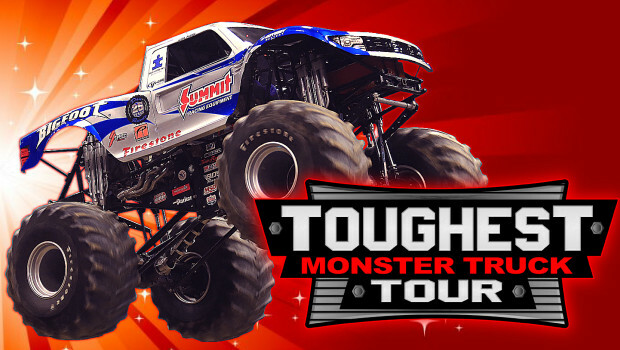 Will you be bringing your family to see these awesome monster trucks? This is a fun time for sure! I would love to go and I know my husband would as well. I am looking for upcoming events in my area.... thanks for sharing.